Principal Cast : Voices of Jim Sturgess, Ryan Kwanten, Joel Edgerton, Hugo Weaving, Anthony LaPaglia, David Wenham, Miriam Margolyes, Helen Mirren, Angus Sampson, Deborah-Lee Furness, Bill Hunter, Sam Niell, Barry Otto, Abbie Cornish. Synopsis: A young owlet, kidnapped (along with his brother) from his nest by a gang of power-hungry militant owls, seeks out the mysterious Guardians Of Ga’Hoole when he escapes capture – and must lead a strike force against the forces of evil. What we think : Quite possibly the best looking animated film we’ve ever – I say again, ever – seen, the film is let down by some underwritten characters and disjointed plot arcs, yet remains a fascinating cinematic achievement. A mix of 300 versus.. well, any Attenborough documentary you care to imagine, Legends Of The Guardians is effective, if not entirely successful, animated film-making. If you could grade a film simply on its visuals, then Legends Of The Guardians would sit atop the pile. By an order of magnitude. As a fan of animation, I cannot praise this film more highly for its incredibly detailed level of realism. It does have some issues against it that prevent a top grading, unfortunately, but as far as the visuals go, I have never seen a film so lifelike and realistic that was borne of a computer. We’ll get to this all a bit later, but for now, I just wanted to make the point right from the outset that anybody viewing this film on anything less that a full HD monitor with BluRay will be doing themselves a disservice. Much like Avatar, Legends is required viewing in HD. It’s that cool. Man, you used to tell a good story – now, you’re just reading junk! Soren (voice of Jim Sturgess), a young owlet who hasn’t yet learned to fly, is kidnapped along with his brother Kludd (True Blood’s Ryan Kwanten) by a gang collecting “orphans” for the army of Metalbeak (Joel Edgerton), an evil own who plans revenge on the legendary Guardians for his disfigurement. 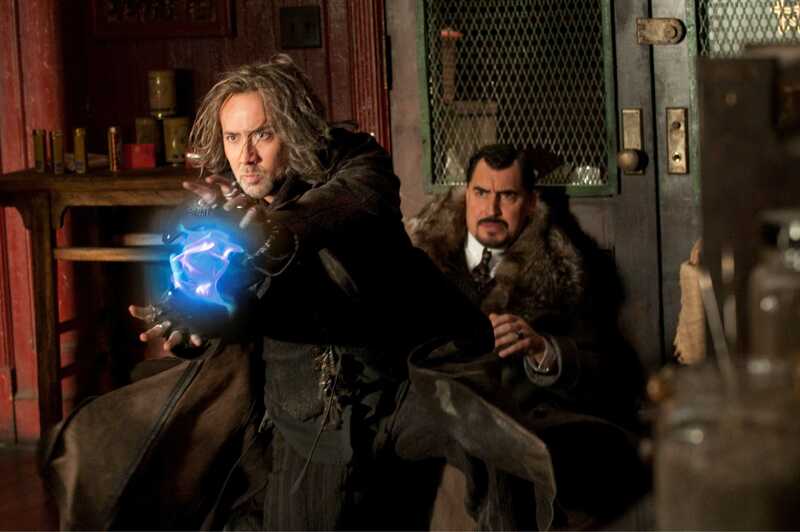 Soren befriends a young owlet Gylfie (Emily Barclay), and with the assistance of Grimble (Hugo Weaving) they escape the owl boot-camp to look for the Legends – an warn them of Metalbeaks’s plans. 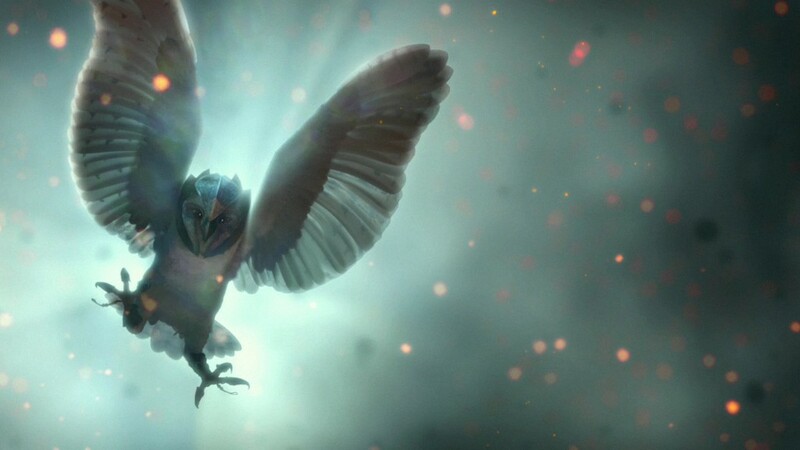 Along the journey they meet Digger (David Wenham) and Twilight (Anthony LaPaglia) , a pair of owls who decide to accompany them “just to see if they make it”, as well as Soren’s nursemaid snake Mrs P (voice of Miriam Margoyles). Upon arriving at the home of the Guardians, Soren discovers his childhood hero, Lyzie of Kiel, is still alive, and willing to teach him how to fight and become a Guardian himself. Kludd, Soren brother, has been brainwashed by Metalbeak and his mate, Nyra (Helen Mirren) into believing he’s a “Pure One”, and that his right to rule over the weaker owls is assured. This, obviously, sets up a battle between Soren and Kludd in the films gigantic climax, as the army of Metalbeak, and the Guardians, come face to face in a fight to the death. Before I tackle the films most astonishing element – its visuals – I want to spend some time discussing what the films weakness are. Legends Of The Guardians is based on a series of books, books I’ll admit I’ve never even heard of prior to this film: so my preconceptions of the characters, the story or the overriding plot are nil. 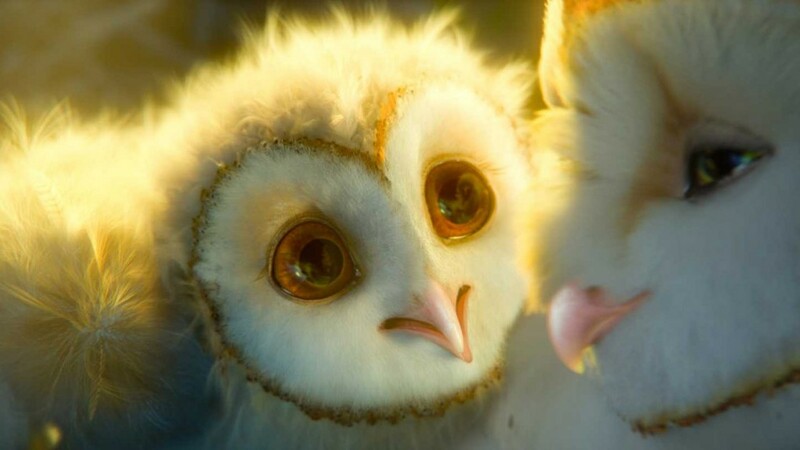 While many of the concepts and ideas within the film take a little getting used to – anthropomorphic owls notwithstanding – the epic nature of the narrative is fairly superficial and derivative. A young owl must find the strength within himself to overcome impossible odds to save the owl-world, confront his brother over their destiny, and get the girl. Many of the elements of Legends Of The Guardians has been done before, often many times – the journey film, the ensemble film with a couple of comedy relief characters thrown in, and the mysterious Obi Wan Kenobi figure dispensing knowledge like Wikipedia and assisting our hero to do the right thing. Director Zack Snyder is unable to overcome the inherent cliche’s these plot points throw up – and while a more discerning viewer might roll his/her eyes in disgust at Hollywood storytelling techniques, the dazzling visuals more than overcome these deficiencies. The films’ major plot point, the conflict between Soran and Klugg, is let down by a fairly weak link between them: their relationship isn’t strongly written or presented to allow us to generate the emotional sympathy required when they come into conflict – and Klugg’s decision to join Metalbeak and become “evil Klugg” isn’t given much time to develop either, it just seems to happen to provide the required conflict. It never feels organic in any way, which leaves the final battle between Soran and Klugg less an emotional plot point and more just going through the motions because the arc needs resolution. Metalbeak and Nyra are evil enough to give the film the weight of oppression and desperation it needs, with Edgerton providing his best Jim Cummings/Brian Blessed impression to give Metalbeak the nasty streak he deserves. The entire cast is filled with a plethora of Aussie talent – many of whom will be unfamiliar to US and British audiences, but names like Angus Sampson, Richard Roxburgh (the Duke from Moulin Rouge), Abbie Cornish, Deborah-Lee Furness (the wife of Hugh Jackman), Lee Whannell (the co-creator of the Saw franchise), Bill Hunter and Barry Otto (both of whom starred in Strictly Ballroom) will be familiar to local audiences here in Australia. Each member of the cast does well with their part, even if the accents are a tad overdone. A side note: the appearance (and frightening behavior) of a Tasmanian Devil early in the film should be a warning to all tourists to our shores – this vicious, violent version of the Bugs Bunny character is closer to the truth than Warner Brothers ever admitted. Flyyyyyyying in the rain, just flyyyyyyyying in the rain!! The titular Guardians themselves are also badly underwritten: Soran and his band of heroes’ arrival at the Great Tree of the Guardians is met initially with doubt and dissent, which gives way to concern and decisive action once the truth about Metalbeak’s plans is known. 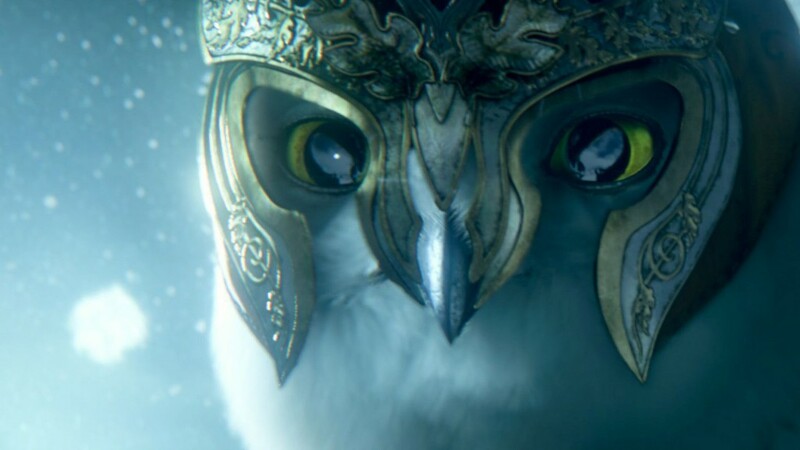 The Guardians are meant to appear heroic and pure, an owl version of the Knights Of The Round Table I guess, but their ineffectual development (at least within the framework of the film) makes them seem more like just another gang of owls protecting their patch. The hierarchy of the owl life, coupled with the fantasy elements of the story, is well presented, albeit it’s quite jarring to see talking owls wearing metal armor and carrying weaponry in their claws like soldiers. Thanks to this, and Snyder’s predilection for stylish, slo-motion battle sequences and uber-cool camera angles, Legends has plenty of absurdly cool moments working in its favour: although they are told in a PG rated way. Indeed, for a film where owls attack, slice and dice each other in a variety of ways with a variety of weapons, Legends is quite bloodless. In fact, at no stage do you see any real carnage, although it is implied at times via the soundtrack or the reactions by other characters. Snyder’s graphically violent 300, or his darkly adult Watchmen, have stylistic flourishes which once more rear up in this film, and where it might appear like fanciful, Robert Zemeckis-styled ego stoking, actually works for the story. The owls’ fighting is so fast and furious, Snyder simply has to slow it down to show us what’s going on. The razor sharp imagery is simply astonishingly cool. Do I have a bid on two owls sitting on a log? Anybody? Anybody? Which brings me to the major plus this film has going for it. It’s gorgeous. Every frame of this film is a work of digital art, a crisp, frighteningly stunning look into a world that could almost be real somewhere. The resolution of the owls feathers, the fur of other creatures, the landscapes and skylines of each and every setting, is stunningly realised to the point where you’re staring, gaggle-eyed, at what the animators have achieved. Wind, rain, fire and water: all legendary problems for computers to resolve realistically – here, they look real. Really real. Legends Of The Guardians is far and away above any animation level I’ve seen yet, Pixar and Avatar included. The detail level in this film simply must be seen to be believed. When you look at the animation for Animal Logic’s last feature film, Happy Feet, you could tell they’re only a few moments away from achieving truly photo-realistic environments and characters: with Legends, they’ve actually achieved it. It’s enough to make a man weep, such is the gorgeous beauty of this film. And it’s Australian, which makes me even more proud to say this. If for no other reason than to witness what can only be described as visual animated perfection, The Owls Of Ga’Hoole is essential viewing for any fan of film or animation. The Owls Of Ga’Hoole might be a mouthful of a title, but the film-making behind this animated movie is solid. The story might be somewhat contrived, and the overwhelming ability to pick how it’s all going to end might sway some to see this is a gargantuan misfire, but I contend that Legends Of The Guardians is a well made, if entirely cliched, masterpiece of animation. With a visual palette such as the one on display here, and the sense of style and cinematic verve brought to us by director Snyder, this film will no doubt be an eventual classic for children of all ages – mind you, younger kiddes will probably want to avoid it due to some of the darker, more serious tones throughout the movie. Cleverly filmed, action packed and filled to the brim with all kinds of eye-candy, Legends Of The Guardians: The Owls Of Ga’Hoole is recommended viewing. Legend of the Guardians Trailer: This is Ga’Hoole! The Legend of Hercules Autographed Poster Giveaway! Awesome! i'm gonna look for this and watch it with the kids…well, the girl-child for sure anyway. Thanks for the heads up! Had no idea that this was directed by slow-mo man Zack Snyder! Now I definitely need to see this one. Good Review Rodney! Thanks Dan, yeah, I think this snuck under a lot of people's radars, to be honest. The more people who know about it, the better, I say!